Gears of War®—a third-person tactical action/horror game—is being developed by Epic Games exclusively for Microsoft Game Studios and the Xbox 360® video game system. As Marcus Fenix, you fight a war against the immense Locust Horde, which not only out powers but outnumbers you, your squad, and the entire force of the Coalition of Ordered Governments. Gears of War is the only game to blend a deep and disturbing story of human survival against an endless mass of nightmarish creatures, a next-generation tactical combat system, and unsurpassed visuals and special effects. The story unfolds as a ragtag group of soldiers use every last ounce of strength to survive the onslaught from the forces of evil, which begins on the historic Emergence Day. 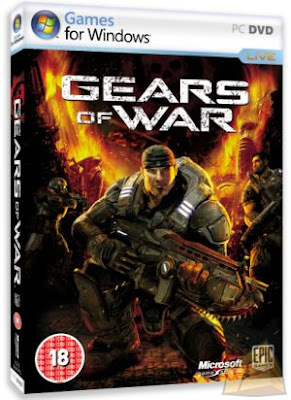 Gears of War is designed for gamers aged 18 and older, who seek a deeper and more connected story that revolves around mature themes and depictions. The massively scoped worlds, memorable characters, and epic story line of Gears of War play out like an intense and unsettling Hollywood blockbuster action film. Movie-quality cut scenes, cinematic camera moves, and in-game storytelling bring the brutal, emotionally charged narrative to life, and this narrative remains alive because it is seamlessly controlled by you, Marcus Fenix.Marching Far Ahead of the Shooter PackGears of War is not a game that’s played but rather experienced. Epic is creating some of the most memorable moments in gaming history, and players will share and recall this experience for some time to come. Gears of War is not just a shooter. You’re not just thrown into a Locust-infested village and led to mow down everything in sight; instead, realistic situations immerse you in the action. While some games can indeed convey a sense of fear, Epic intends to strike at the reality of fear. The entire atmosphere is designed to lock you in place while white-knuckling your controller and feeling your heart pumping in your ears. Epic’s goal is an exhilarating ride through the travesty of Sera surrounding you right in your living room.